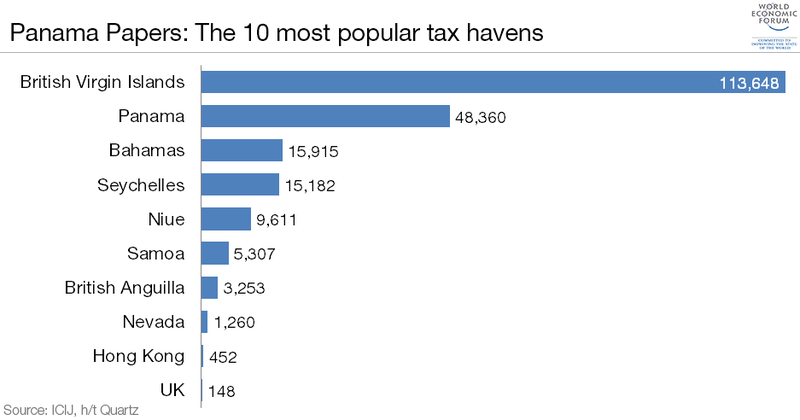 The Panama Papers represent the biggest leak the world has ever seen. The 2.6 terabytes of data, containing 11.5 million documents, dwarfs all previous data leaks seen to date. 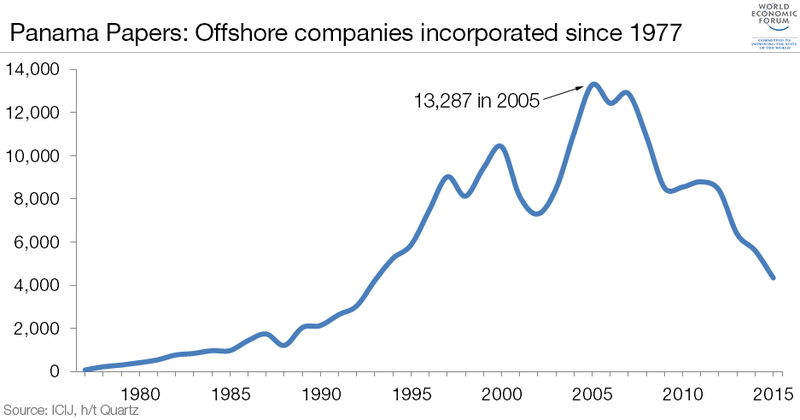 The data, which exposes the use of tax havens, mostly consists of e-mails, photos, pdf files, spreadsheets, and "excerpts of an internal Mossack Fonseca database" dating back to the 1970s, according to Süddeutsche Zeitung , the German newspaper that received the leaked files. Here are five charts that help explain the leak in a bit more detail. 1. The leaked files from Mossack Fonseca contain nearly 40 years of data on over 21,000 companies. 2. One out of every two companies appearing in the leaked Mossack Fonseca documents were incorporated in the British Virgin Islands. The second most popular destination for company registrations in the files was Panama, where Mossack Fonseca is headquartered. 3. 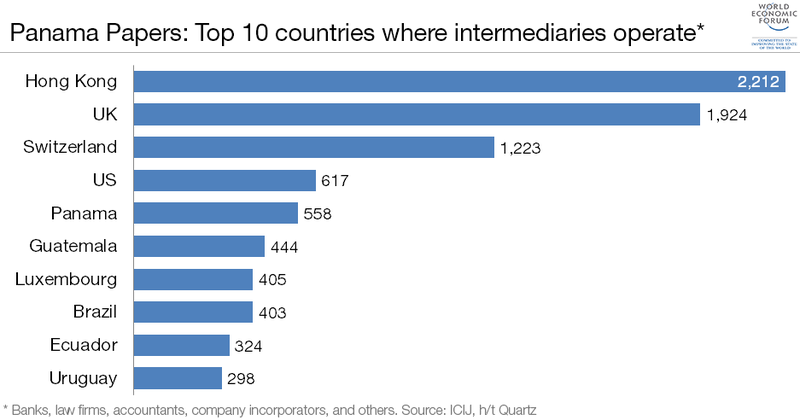 Hong Kong topped the list where "intermediaries" (banks, law firms, accountants, and more) operate. According to the International Consortium of Investigative Journalists, Mossack Fonseca worked with "more than 14,000 banks, law firms, company incorporators, and other middlemen to set up companies, foundations and trusts for customers." 4. The leak is the biggest one to date - dwarfing Wikileaks, the HSBC files, the Luxembourg tax files, and the Offshore leaks combined . 5. And what's in the leaked files? 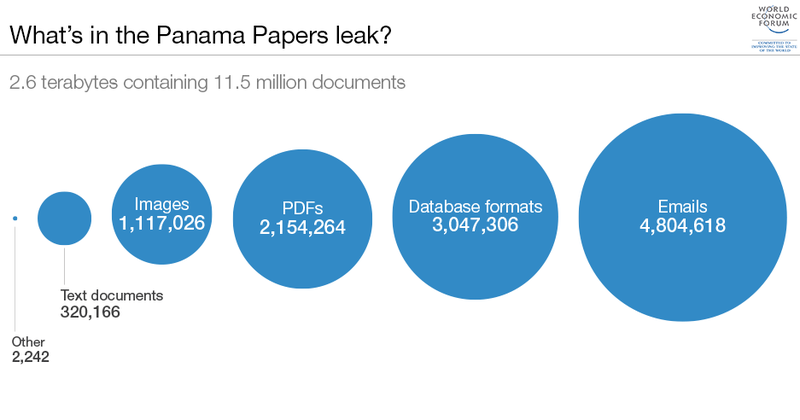 Over 4.8 millions emails, 3 million "database formats", 2 million PDFs and 1.1 million images. Have you read? Jeff Jarvis: This was the post-Snowden Davos How should we balance security and privacy on the internet? Can you have both security and privacy in the internet age? h/t Quartz , ICIJ .